These are the best nappy pants I have tried. Super absorbent and a very soft inside. They can last overnight without and leaks. They are great for a wiggly Bub that doesn’t want to stay still to be changed. They have super stretchy sides that are easy to get on without ripping. Also love that they come in a bigger size box. We have just started using this product as our toddler has started toilet training. I put them on her when we head out as it allows me to quickly take down her nappy if she needs to go to the toilet yet prevents wet accidents in the event she doesn’t make it to the toilet in time. Does the job! 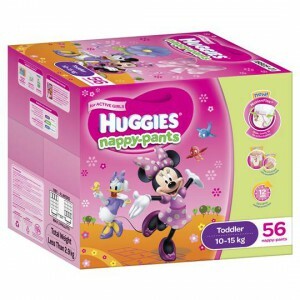 How would you rate Huggies Nappy-pants Toddler Girl 10-15kgs Jumbo?